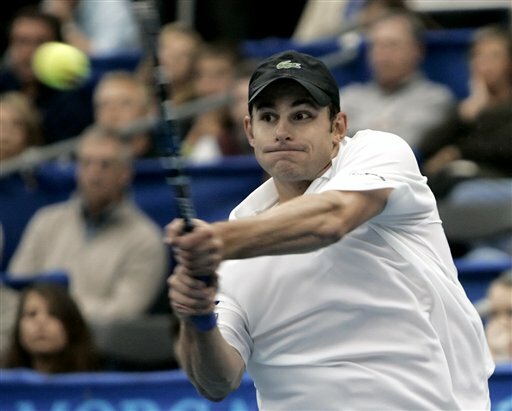 Andy Roddick got a little revenge Saturday against Andy Murray for last weekend's semifinal loss in San Jose, beating the young Scot 6-3, 7-6 (4) to advance to the final of the Regions Morgan Keegan Championships. "You don't want to go out of a tournament to the same guy two weeks in a row," Roddick said. "I probably wouldn't have been much fun to be around tonight if that would've happened." Ranked fourth in the world, Roddick had lost three of his first four matches with the 19-year-old Murray. But the top-seeded American broke Murray when serving for the second set and fought off a set point to hold serve and force the tiebreaker, which he finished off with a pair of 130 mph aces. Roddick will play defending champion Tommy Haas, a 6-3, 6-4 winner over Mardy Fish, in the first meeting of the top two seeds at this tournament since 1987 when Stefan Edberg beat No. 1 seed Jimmy Connors. Venus Williams was set to play Shahar Peer of Israel in the Cellular South Cup championship Saturday night. Williams, sidelined since October because of an injured left wrist, is aiming for her 34th career title. Roddick, who won here in 2002, reached his third final in Memphis and first since the U.S. Open last September using his powerful serve. He served up 15 aces, hitting 136 mph in the opening game. He broke Murray in his first service game and won the first set in 31 minutes. "I definitely kept the match more at the baseline today," Roddick said. "I don't know if that was better or worse. I just didn't want him dictating the points and what was happening with those short little chips." The 13th-ranked Murray had won eight straight matches going back to San Jose, which he won including that victory over Roddick. But he said he was lethargic to start and hit repeated shots wide or into the net. Murray fought off a break point in the first game of the second set, which seemed to give him a boost. He broke Roddick in the eighth game and went up 3-5, which upset Roddick. But serving for the set, he fell behind 0-40, and Roddick broke him easily as Murray hit a backhand long. "I gave myself a chance," Roddick said. The Scot won four of the first five points in the tiebreak. Roddick took six of the next seven in a tiebreak that featured a do-over when the umpire overruled a linesman who called a Roddick shot out. Roddick then hit a forehand winner off Murray's serve and followed with the aces. "I didn't play a great match today," said Murray, 15-3 this year. "I had my chance 5-3 to win the set, played a horrible game to get broken. In the tiebreak, I mean I missed one bad shot at 4-3. ... To be fair, he came up with some big serves and some big shots and deserved to win the match." With this victory, Roddick will move up to third in the rankings for the first time in a year and has a chance Sunday at his 22nd title and first since Cincinnati in 2006. He doesn't feel like he's played well this week but has not dropped a set here. "It's satisfying, especially after last week and that match there. To just reverse it, it's a good feeling," Roddick said. Haas has played so well he has yet to face a break point this week, and he will try to win his third title in Memphis. Haas improved to 12-2 this year and is in position to win his 11th career title. "It's nice. You know it's a familiar place here for me," said Haas, ranked No. 9. "It's a good feeling to be in the final of another tournament again, and it's been a while. So it's great. I'm really happy with the way I played today against Mardy." Haas started off strong against the fourth-seeded Fish. He broke the American's serve in his first game and quickly led 3-0 before closing out the set in 31 minutes. Fish came in enjoying the best start of his career at 12-3. He was trying to reach his first final this year, but he struggled a bit with his serve and tendinitis in his right kee. He had 16 aces but double-faulted twice _ including on break point in the first game of the second set. Fish said he couldn't keep up with Haas, who used shots down the line or crosscourt for winners. "You're not going to make maybe one or two out of 10, some of the shots I made today," Haas said. "It seemed like they always came at a pretty good time as well." Haas closed out the match with a 113 mph ace that Fish could only acknowledge by saying, "Yep." "Usually you don't find too many guys who can serve big and return well. If he's serving well, he can win a lot of matches," Fish said.